This month I am the featured “Food Blogger of the Month” over on The Local Palate, which is a huge honor that I was delighted to receive. Yesterday they published an essay that has long been percolating in my brain- What Makes Us Southern. This is something I feel strongly about, because as a North Carolinian I am routinely told by other southerners that North Carolina is, in fact, not the “real South.” This is something that I routinely reply with “that’s rude” and often “I actually live further South than you do in your “real Southern” city (I’m looking at you, Atlanta and Birmingham). My point in the essay is that what defines the South is not a cultural stereotype or even a strict geographical region, it’s a spirit, a culture, a community. And that community is big enough for all of us Southerners. The Local Palate also invited me to dig through their archives for a recipe that I thought perfectly represented this glorious fall season and recreate it in my kitchen. 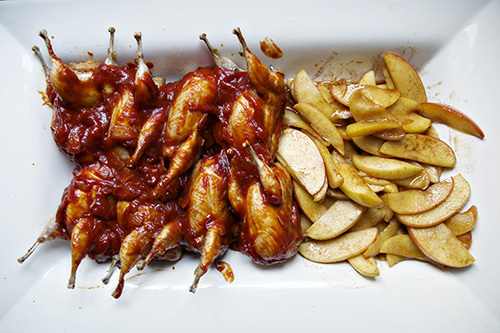 After looking through all of my options (and there were a ton) I settled on sausage stuffed quail with a sorghum barbeque sauce and fried apples. So… heaven? 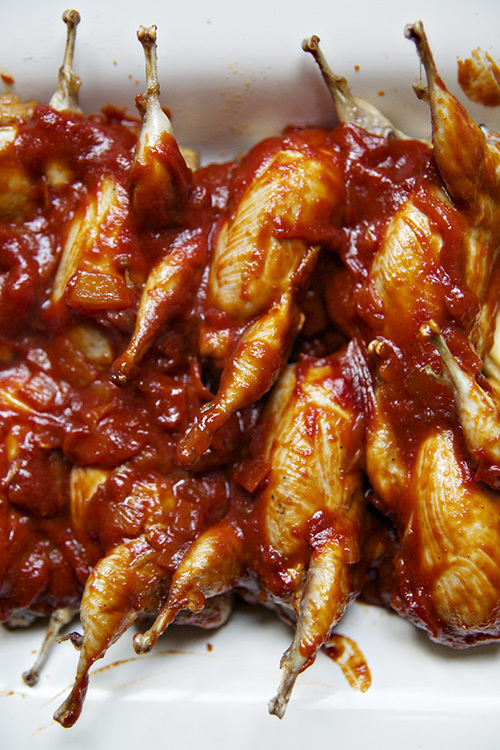 The sauce was sorghum based, which made for a sweet and spicy experience. 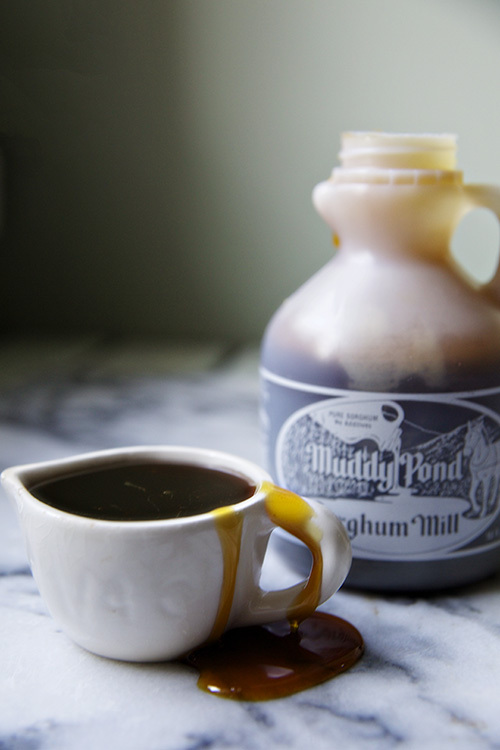 Sorghum is a grain that is native across the world, from the Tarahumara sorghum of Mexico to the bicolor sorghum of Africa, which is used to make the molasses-like syrup we know and love across the South. 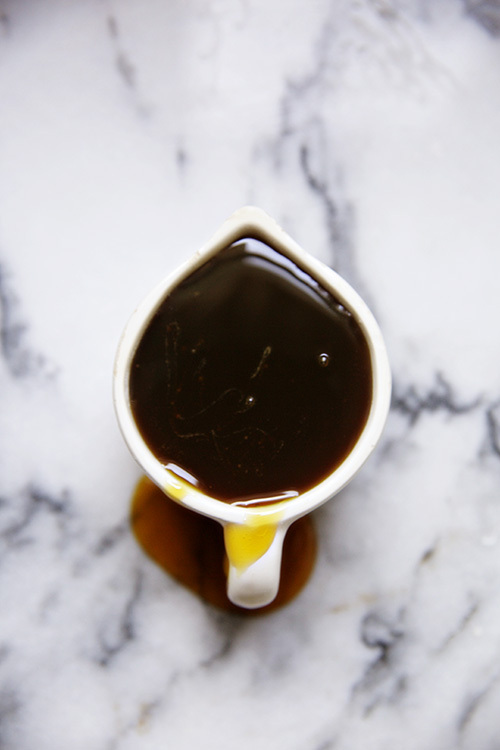 The sauce blends the sweet and rich sorghum with tomatoes, vinegar, and spices and the result is a brighter take on a traditional barbeque sauce. 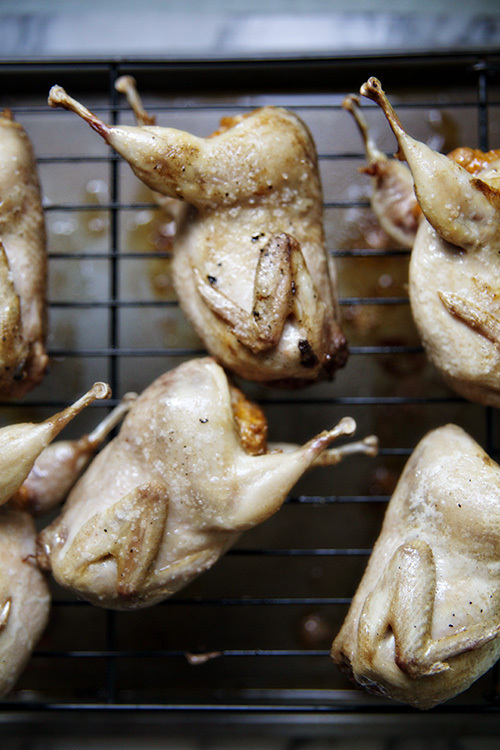 Cooking with quail was a new experience for me, but one that I enjoyed tackling. Quail is beloved game for the holiday table in our house, so I had a good idea of what I was getting myself into. I stuffed the quail with ground chorizo sausage and after a quick sear in bacon fat they went into the oven, coming back out fifteen minutes later crisp and browned and smelling heavenly. Accompanying the quail was a big batch of fried apples, essentially apple pie filling without the dough. Which, paired with the saucy and the flavor of the quail, hit the spot. I served this with a kale and apple salad and a big batch of garlic skillet smashed potatoes. I’ve long admired the work that The Local Palate is doing, bringing into focus the food culture of the South, a food culture that is seeing a tremendous shift back to its roots. This recipe, like all of their recipes, blends food traditions from all over the South into a dish that represents perfectly the culture that I love so dearly. Not to mention it’s the ideal recipe to ring in one of the South’s most incredible seasons. Begin with your barbeque sauce. In a sauce pot heat your oil. Add garlic and onion to the pot and cook until they begin to brown. 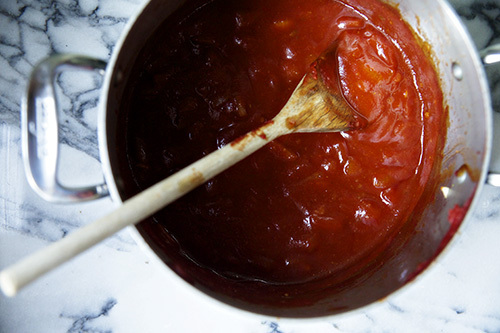 Stir in tomato paste and stir until it caramelizes. Add in vinegar, water, sorghum, ketchup, mustard, garlic powder, and salt. Stir well and reduce heat to a simmer. Simmer for 2 hours. While your sauce is simmering, slice your apples. 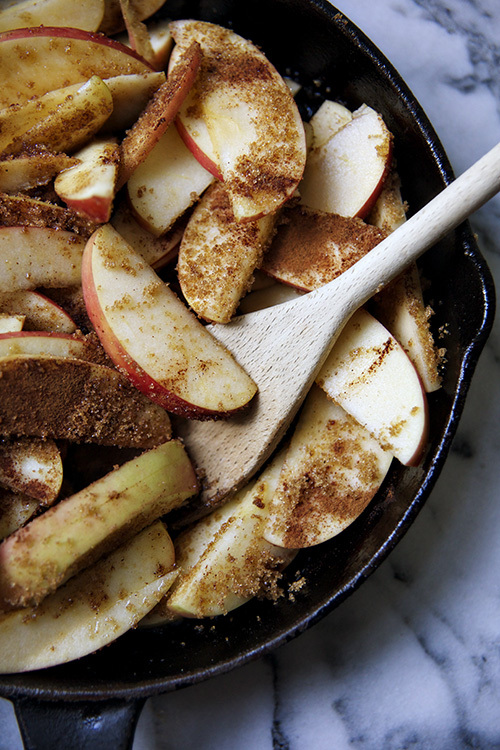 Melt butter in a pan and add in the apples, brown sugar, and spices. Stir to coat the apples and cook, stirring occasionally, until apples are tender but still have a crunch. Stir in lemon juice to brighten the flavor. Heat your oven to 350F. Stuff each bird with 2 tbsp of sausage. Melt bacon fat in a skillet and salt and pepper the quail. Sear in the skillet for 1 minute on each side, and then transfer to a rack sitting on a baking sheet. 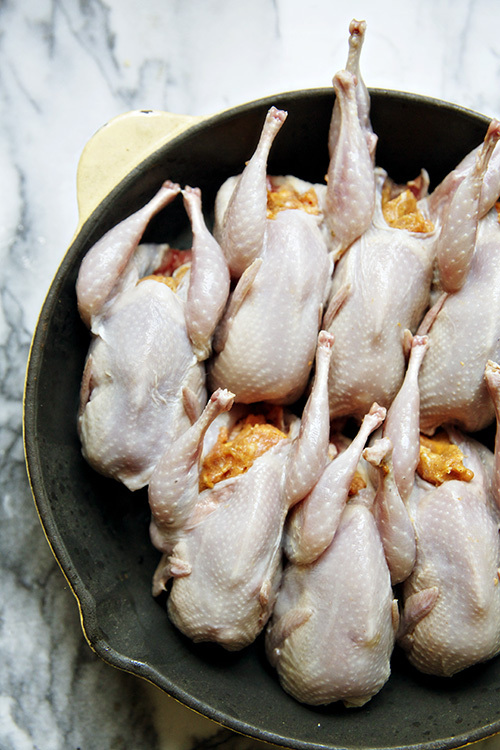 Cook for 10-15 minutes or until the internal temperature of the quail reaches 140F. 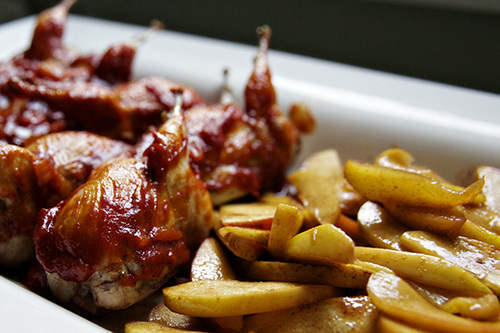 Transfer your quail to a serving dish and brush with sauce. Serve alongside fried apples immediately. Congrats on your feature! The quail looks amazing!